Kingfisher Lodge is situated on the banks of the Sunday’s River in a peaceful and quiet area of Graaff-Reinet. The town was established in 1786 and is the fourth-oldest town in South Africa. The surrounding farmland epitomizes the Karoo. The town has retained much of its architectural heritage and it is no wonder that it is known as the ‘Gem of the Karoo’. Set in a beautifully maintained garden, against the backdrop of a variety of old trees which attract a variety of birds, there are seven luxury guest suites. 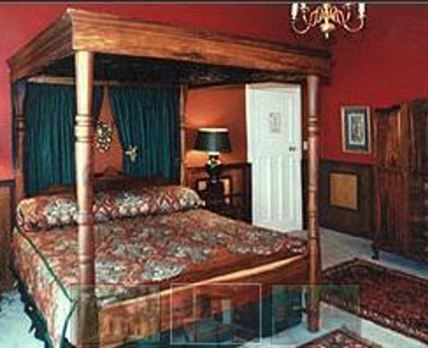 Each suite is tastefully decorated in a distinctive style with antiques, brass beds and woollen and mohair carpets. All rooms are en-suite and some have both a shower and a bath. All rooms have private entrances and secure parking. The rooms are equipped with ceiling fans, desk fans, electric blankets and oil heaters to ensure the comfort of guests in all weather conditions. Tea and coffee facilities and TVs are provided in each suite. Décor in the main house features more antiques, woollen and Persian carpets and original paintings. Original doors, hand carved by Zanzibar slaves for Cecil John Rhodes’ Estate, Groote Schuur, can be admired in the main house. The stained glass door of the dining room provides a gracious link between the main dining room and the drawing room with its yellowwood ceiling. The opulently appointed lounge is one of five living areas which include the sun porch, drawing room, enclosed patio and the lapa area near the swimming pool. Many national monuments and historical buildings can be found in and around Graaff-Reinet. These include the Dutch Reformed Church, Old Library, Hester Rupert Art Gallery, Reinet House, John Rupert Little Theatre, Old Residency, Urquart House, Graaff-Reinet Pharmacy, Powder Magazine, Drostdy and Stretch’s Court, Cacti and Succulent Collection, Kalkkop Impact Crater, First Midland Hospital, St James Church, Union Monument, Town Hall and War Memorial, Cradock Street and the private dwellings. Click here to enquire at Kingfisher Lodge.